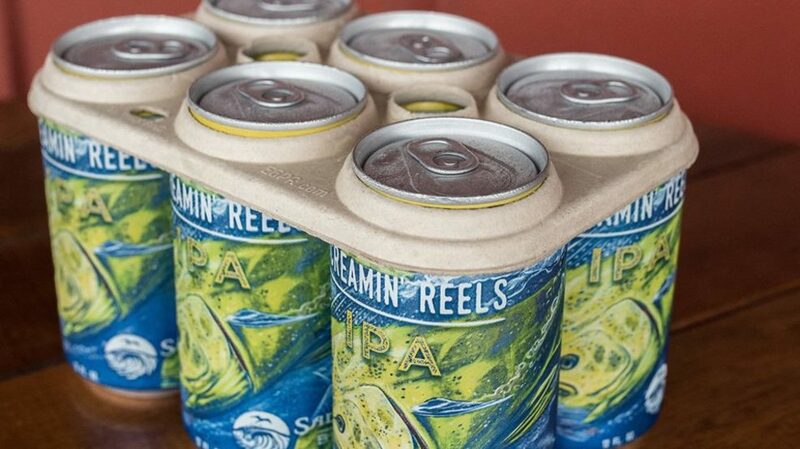 A microbrewery in Delray Beach, Florida has devised a crafty solution to plastic six-pack rings that often wreak havoc on marine wildlife. After years of research and development, Saltwater Brewery has introduced six-pack rings made of wheat and barley. The brewery developed the rings with a start-up company called E6PR. Whereas plastic rings can become tangled in the wings of sea birds, warp the shells of growing sea turtles and choke seals, Saltwater Brewery’s new rings are not only biodegradable but also perfectly edible. “E6PR hopes other breweries — both small and large — will buy into the new rings and help bring costs down,” Nola.com reports. The Louisiana State University (LSU) reports that the Gulf of Mexico has one of the highest concentrations of marine plastic in the world. Every net that LSU dipped into the Gulf’s water came up with some form of plastic. “We found it every time,” LSU’s Mark Benfield told NOLA.com. A group that volunteered to clean a three mile stretch of Elmer’s Island gathered over 170 plastic six-pack rings, in addition to 4,000 pounds of other trash. Craftbeer.com reports that E6PR is testing the edible rings with “a select group of craft breweries,” but the company is not yet ready to discuss specifics. “Time will tell if any Louisiana breweries incorporate the rings,” Nola.com reports. This story was originally published by KUTV on May 31.